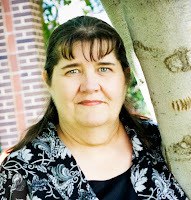 In keeping with Monday's release party for The Rails to Love Romance Collection which includes a novella, Honeymoon Express, by our very own Inky Susanne Dietze, I'd like to show you a few of my train photos. And if you think this is a way for me to be connected to a book which I somehow missed submitting a story to, then you would be absolutely correct! 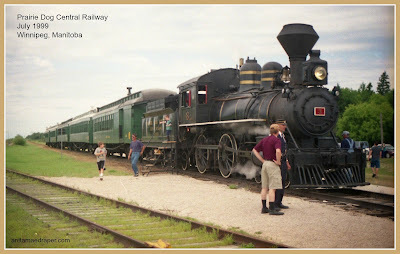 In July 1999 we stopped off in Winnipeg, Manitoba to ride the Prairie Dog Central Railway. We only went about 40 miles all total, but there were a couple stops for bathroom breaks as the coaches didn't have plumbing. One of those stops was at a Farmer's Market which was nice, and then we turned around using a wye, and headed back with another break on the way. Altogether it was about 3 1/2 hrs. The #3 steam engine on the Prairie Dog Central Railway was built in Glasgow, Scotland, in 1882, was shipped to Canada, and went into service in 1883. Most of her time was spent in Western Canada. 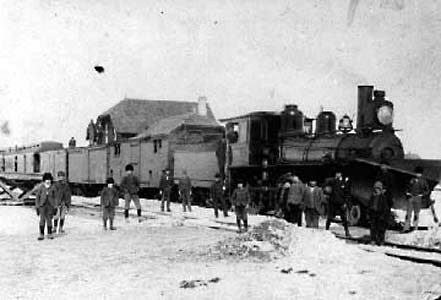 The Manitoba Historical Society has this photo of Steam Locomotive # 3 as it made history in 1896 by pulling the first train into Dauphin, northwest of Winnipeg. By the way, if anyone is looking for information on the Hudson's Bay Company, the Manitoba Historical Society website is the place you want to be looking at first. One more photo I wanted to show of Engine # 3 was taken in July 1999, like the first one above, except this one has Nelson at the top of the stairs holding one-year-old Jeremiah, while Nick and Jess are standing on the platform about to go inside. Do you know I can still smell the smoke and feel the jerky swaying of that train as if it was only a couple of years ago, and yet this past June we celebrated Jeremiah's high school graduation. This next photo is a historical tidbit for you as it shows what the end of the cars looked like before the vestibule was put into use in 1887. I took the photo while enjoying the history of Calgary Heritage Park on my 2011 Alberta trip. The photo not only shows open air between the two cars, but there's no platform or board even connecting the two of them. Then in 1887, the Pullman people invented a flexible gangway which joined two cars together enabling people to safely walk from one car to the other. Prior to vestibules, people brought their own meals, and many trains made stops for meals and overnight accommodation. 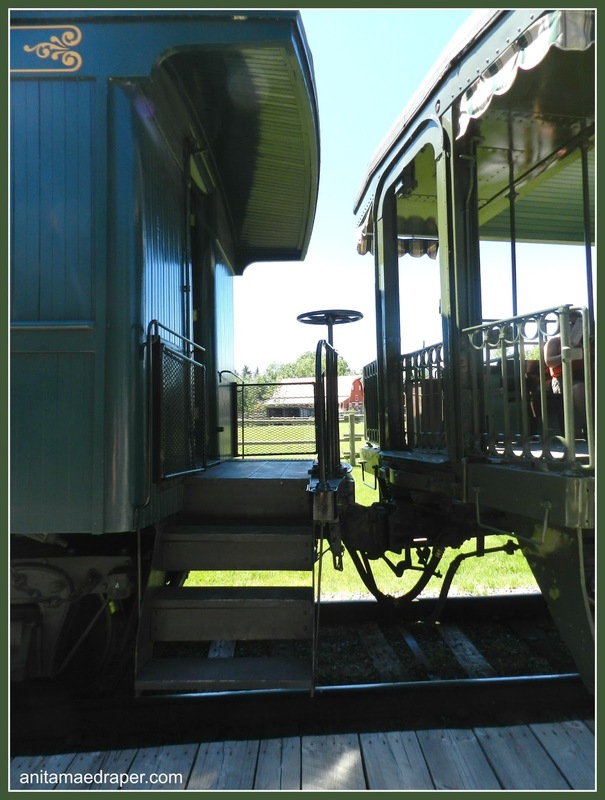 But once the vestibule was in place, specialty cars like dining, sleeping, and parlor cars were added on and passenger travel by train changed forever. 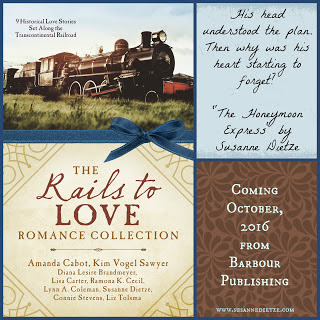 As a train lover, I'm really looking forward to reading The Rails to Love Romance Collection. For a chance at winning a copy, click here. I've enjoyed riding in trains pulled by old steam engines in Winnipeg, Calgary, and Moose Jaw, and I've walked through several more in Saskatchewan's Western Development Museums. What about you? Have you ever taken an old-fashioned train ride? Crossed a vestibule in a modern train? Checked out a museum train? I do enjoy talking trains. 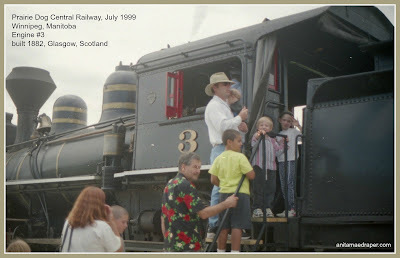 We took a steam engine train ride in South Dakota near Mount Rushmore a few years ago. That was fun and interesting to see the scenery around there. Hi, Elaine. The Ogema steam train is about 1.5 hrs southwest of me and I always seem to be heading northwest, west, or east in my travels. However, my mil went on it as a Senior excursion and loved it. It's on my bucket list. The Prairie Dog Central didn't have train robbers back in '99, and it's not touted as a regular event, but their photo gallery shows it happening, so it could be a special added on for charters. Thanks so much for visiting us today. Happy Fall! Hi Anita! What a great post! I love all the train photos, and they remind me of photos from my own childhood riding various trains. The Grand Canyon Railroad had a train "robbery", as well as a serenading cowboy. Super fun. I don't know if those robbers were masked or not! LOL! Thanks, Susie. As soon as I heard about your Grand Canyon Steam train I added it to my Trips to Take Pinterest board.